—We don’t know about the rest of the country, but in Chiapas those above are losing the media war. We have seen entire families support the teachers, in the rural areas as well as the urban. And we aren’t talking about support of the “we see your raised fists” type, or that of “the people united will never be defeated” and other slogans that continue to be the same despite distances in calendar and geography because below solidarity continues to be a basic principle. But if in previous mobilizations among the rebellious teachers, the “citizens” (a term that hides inequality) were bothered and fed up, now things have changed. There are more and more families helping the teachers, donating support for their trips and marches, becoming anxious when they are attacked, offering food, drink, and refuge. They are families who, according to the taxonomy of the electoral left, have been “dumbed down” by television, or are “sandwich-gobblers,”[i] “deranged,” “sheep,” “people without conscience.” But it seems that the outsized media campaign against the teachers in resistance has failed. The resistance movement against the education reform has become a mirror for more and more people-people (meaning, not social and political organizations, but ordinary people). It is as if the resistance has awoken a collective sense of urgency in the face of the coming tragedy. It is as if every swing of a police baton, every canister of tear gas, every rubber bullet, and every arrest warrant were eloquent slogans: “today I attack her, him; tomorrow I’m coming for you.” Perhaps that is why, behind every teacher there are entire families that sympathize with their cause and their struggle. Why? Why does a movement that has been fiercely attacked on all sides continue to grow? If they are “vandals,” “slackers,” “terrorists,” “corrupt,” and “opposed to progress,” then why do so many people below, no small number in the middle, and even a few above salute the teachers, even if sometimes in silence, for defending what anyone would defend? —After more than three years of promoting the supposed “education reform,” Mr. Nuño[iv] still cannot present any argument even minimally related to education in favor of what is really his “payroll adjustment program.” His arguments have been, up to this point, the same as any overseer during the era of Porfirio Diaz: hysterical screaming, blows, threats, firings, and imprisonments—the same things employed by any sad and mediocre candidate that aspires to play the role of postmodern police. —They have beat them, gassed them, imprisoned them, threatened them, fired them unjustly, slandered them, and declared a de facto state of siege in Mexico City. What’s next? Will they disappear them? Will they murder them? Seriously? The “education” reform will be born upon the blood and cadavers of the teachers? Are they going to replace the teachers’ encampments with police and military encampments? Are they going to substitute the protest blockades with those of tanks and bayonets? —Lessons for Nuño on terrorism: the taking of hostages (which is what the detention of members of the CNTE leadership is), for whatever kind of terrorism (by the state as well as by its fundamentalist mirrors) is a mechanism to force dialogue and negotiation. We don’t know if there above they realize it, but it turns out that the other side (the teachers) is the one seeking dialogue and negotiation. Or did the SEP (Department of Education) affiliate with ISIS and start taking hostages just to sow terror? —There is an anecdote that circulated among the government intelligence services of the great powers. It is said that in order to win the media battle during the Vietnam War, the North American intelligence services created—that is the word specifically—scenes of resounding victories, of the growing weakness of the enemy, of the moral and material strength of the US troops. As it turns out, the strategy called “winning hearts and minds,” initially destined to be waged in Vietnam, instead had to be waged in the streets of the big cities of the United States. After that April of 1975—which echoed back to another defeat at Playa Girón [Bay of Pigs] in dignified Cuba the same month, but in 1961—a North American official said: “the problem is that we fabricate so many lies for the media that we end up believing them ourselves. We created a staging for victory that hid our defeat. Our own stridency kept us from hearing the noise of our own collapse. 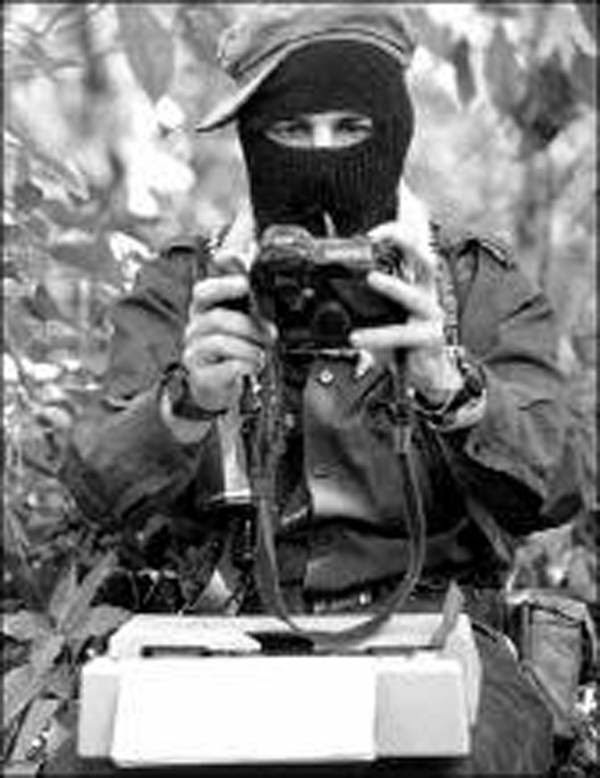 It’s not bad to lie; the bad thing is to believe one’s own lies.” Anyway, clearly we Zapatistas don’t know much about the media, but in our humble opinion, it’s bad business to head up a press campaign for a shameless privatization with a sad, mediocre overseer who wants to be a policeman. —What the teachers [maestros, maestras, maestroas] do is start children off in the first steps of science and art. [i] A derogatory term referencing those who accept gifts or handouts—often a sandwich at a rally—from the political parties in return for support. [ii] Traditional dancers from Chiapa de Corzo, Chiapas. [iii] Manuel Velasco Coello is the governor of Chiapas, nicknamed el güero Velasco for his whiteness. [iv] Aurelio Nuño Mayer is Secretary of the Department of Education.